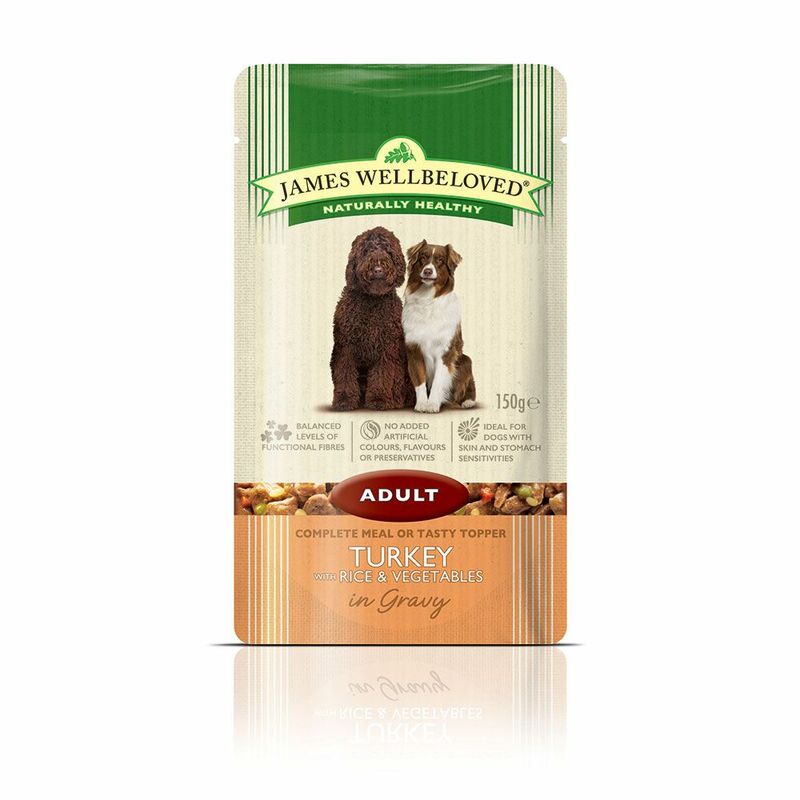 James Wellbeloved Adult Pouches - Turkey with Rice & Vegetable for adult dogs is a tasty and healthy complete wet dog food. See below for the best deal on James Wellbeloved Adult Pouches. Big Savings on James Wellbeloved Adult Pouches! James Wellbeloved Adult Pouches - Turkey with Rice & Vegetable for adult dogs is a tasty and healthy complete wet dog food. James Wellbeloved only use a single source of meat protein (Turkey) with easily digested rice and vegetables to reduce the risk of food intolerances. The food also contains extra ingredients such as alfalfa, seaweed, and linseed to aid digestion and soothe itchy coats. As you would expect from James Wellbeloved the pouch food contains no added artificial colours, flavours or preservatives, no beef, no pork, no wheat or wheat gluten, no dairy products, no egg and no soya. James Wellbeloved Adult Pouches - Turkey with Rice & Vegetables at a glance: Single source of meat protein: Turkey Easy to open Pouches can be fed on their own or as a tasty topper for dry food Hypo-allergenic wet dog food Contains no added flavours, colours or preservatives Contains no beef, pork, wheat or wheat gluten Contains no dairy products, egg or soya James Wellbeloved avoids using many of the ingredients renowned for causing food intolerances. This means James Wellbeloved cat and dog food and treats do not contain beef, pork, wheat or wheat gluten, dairy products, eggs or soya. James Wellbeloved Adult in pouches is a balanced, tasty wet food, suitable for all adult cats, inclu.. The James Wellbeloved Turkey & Rice is a rich source of Turkey and carbohydrates of rice and barley,..
James Wellbeloved Adult Pouches - Turkey with Rice & Vegetable for adult dogs is a tasty and healthy..
James Wellbeloved Adult Cat Light - Turkey is complete dry dog food which has been formulated specif..
James Wellbeloved Fish Light is formulated to meet the needs of the adult cat which is overweight or..
James Wellbeloved Adult Large Breed Lamb & Rice kibble has been formulated to meet the needs of big ..
James Wellbeloved Duck & Rice is a complete dry dog food made with lean, easy to digest duck, a nove.. The Best Deals online for James Wellbeloved Adult Pouches and your essential Pet Supply Products. Order over £29 and get FREE DELIVERY on all orders today. Most orders are processed and dispatched within 24 hours from this supplier (zooplus) and their delivery service partners provide online parcel tracking facilities, active from 2-3 days after dispatch of your James Wellbeloved Adult Pouches order. The suplier 'zooplus' offers International shipping to the countries listed in the table below for shipping on James Wellbeloved Adult Pouches. James Wellbeloved Adult Pouches requires a £2.99 Delivery Fee from the supplier for deliveries within Great Britain. Orders over £29 qualify for Free Delivery. This can be checked using shipping calculator to your post code on the suppliers web site when purchasing.